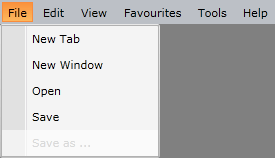 Disabling all menu items can be easily done by just setting the IsEnabled property of the RadMenu parent control to False. This will disable the top-level menu items and they won't be expandable. To disable a static menu item you just have to set its IsEnabled property to False. Note that disabling an item will prevent it from expanding its child items (if any). Before you continue reading this topic, you might find useful to take a look at the Binding to Dynamic Data topic. In order to disable a dynamic menu item you have to bind its IsEnabled property to the appropriate boolean property of your data item. To do this you have to define a ContainerBinding for the HierarchicalDataTemplate, used to display the items. In this way the IsEnabled property of the data item's container (the RadMenuItem) will be bound.